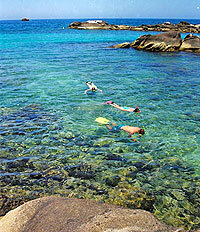 Looking for an activity that really sums up the word paradise? Imagine sailing on a beautiful Cabo San Lucas afternoon, on a private 16 foot catamaran (Hobie cat) out to Land's End, and the most famous landmark in Cabo San Lucas, El Arco (The Arch). See the lazy sea lions basking in the sun, enjoy snorkeling with colorful tropical fish at Pelican Rock, and more. The tour begins with a boat ride out to Pelican Rock, where you will get to snorkel at your leisure with tropical fish and other sea life for about an hour. 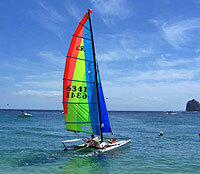 Then you will return to the beach and prepare for your guided Hobie Cat adventure. You will have a friendly tour guide with you to tell you about the area, to take photos of you, and even to help you learn to sail the catamaran! Total relaxation, and since it's a private tour, your guide can tailor the tour to your interests, time permitting. Water Taxi from the marina to the beach club is provided for $5.00 per person round-trip, paid in cash when you board the boat. Price is total cost for up to 2 people, not per person.